Greek watermelon feta salad is a refreshing summer salad with a lime vinaigrette and fresh mint. Is there an ingredient that screams summer more than watermelon? I don’t think so! Watermelon was always a favourite summer snack when I was growing up, my mom would cut it into cubes or wedges and my sister and I would get all sticky eating it outside on the deck of my grandmother’s cottage. But those aren’t my only memories of watermelon. In Greece, every meal is finished with a plate of fresh watermelon. When I saw this recipe for Greek Salad, I knew that I had to try it. A couple of years ago, several of my friends and I had a barbecue and one of the salads we served was something similar to this watermelon feta salad, but we used basil instead of mint. While I was a little apprehensive at first, this salad was so good. Recently, when I was grocery shopping a sweet man stopped me to ask how you should choose the right watermelon, and there are a few things to keep in mind. First of all, you want a symmetrical watermelon that is free from any sort of damage. Because watermelon is 92% water, it should be heavy for its size. Something many people don’t know is to look for a light yellow spot on the bottom (this is where it sat on the ground and ripened in the sun). For this salad, I made a few tweaks to the original recipe and opted for a lime vinaigrette instead of a balsamic dressing. I like lime because it adds a lot of acidity, but it doesn’t mask any of the watermelon flavour. 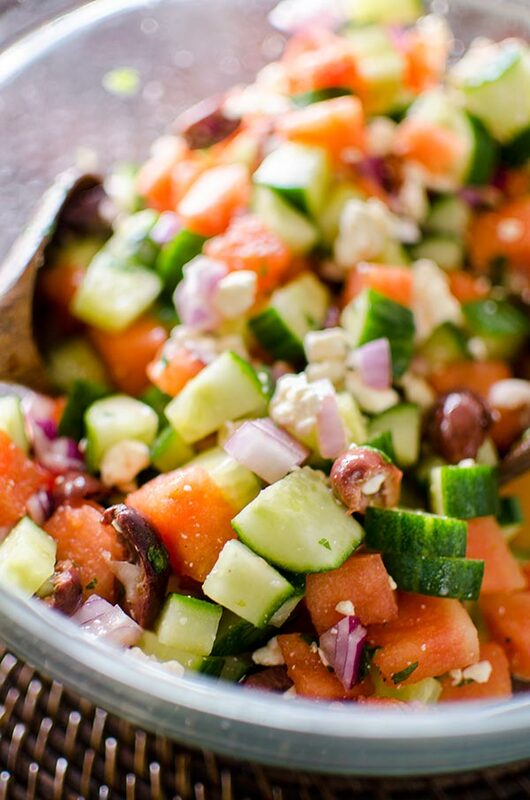 This Greek watermelon salad is the perfect recipe for entertaining. 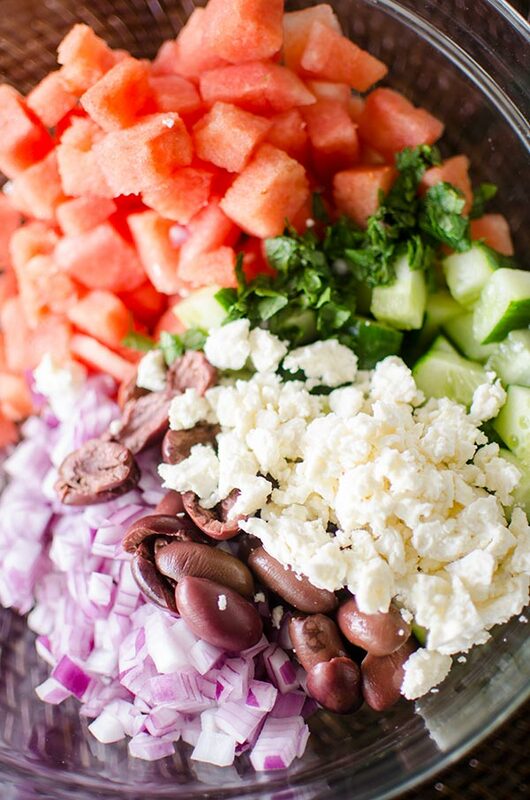 With watermelon, cucumber, red onion, Kalamata olives and feta this salad is not only beautiful and bright, but it’s also quite budget friendly. I find we are all more social during the summer; having friends over for drinks or appetizers, watermelon is the perfect choice. According to a study in 2010 by the Perishables Group, watermelon actually ranks first on the list of budget-friendly fruits, at only 14¢ per serving. 1. 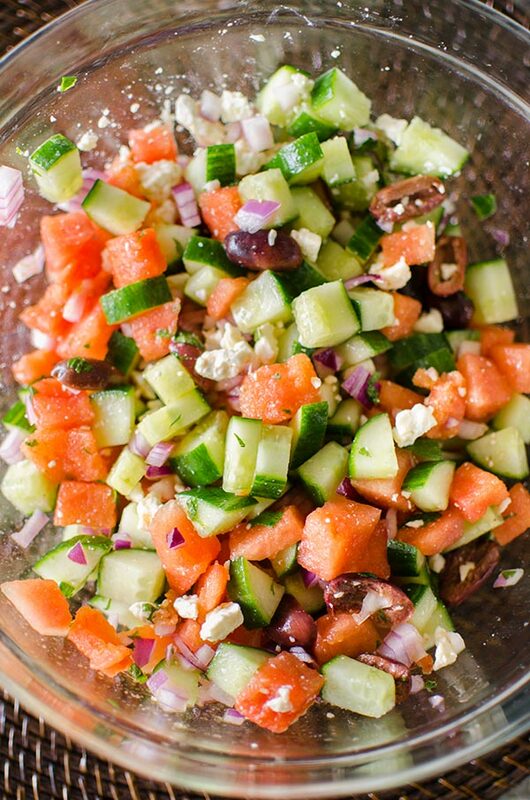 In a large bowl, add watermelon, cucumber, onion, olives, feta nad mint. 2. In a small bowl, whisk oil, lime juice, lime zest, garlic and salt. Disclosure: This post was sponsored by The National Watermelon Board– as always, all opinions are my own. Thank you for supporting my sponsors and allowing me to continue creating recipes like this Greek Watermelon Feta Salad. Wow, Its looking delicious. i love watermelon salad . I would try it for sure. Your recipes are superb. Thanks for sharing. Thanks Pavita, I love watermelon salad too!